Curiosity will carry the most advanced payload of scientific gear ever used on Mars' surface, a payload more than ten times as massive as those of earlier Mars rovers. MSL's assignment: Investigate whether conditions have been favorable for microbial life and for preserving clues in the rocks about possible past life. When NASA's next Mars rover, Curiosity, arrives at the Red Planet next month, it will help pave the way for the humans who might one day follow. That's why NASA's Human Exploration and Operations Mission Directorate paid to include a radiation detector onboard the car-size Curiosity, the centerpiece of the Mars Science Laboratory mission, which is run by NASA's Jet Propulsion Laboratory. The $2.5 billion rover launched Nov. 26, 2011. It is designed to work for at least two years on Mars. The Radiation Assessment Detector (RAD), in fact, began running during Curiosity's eight-month journey to Mars. Radiation from the sun and galactic cosmic rays occur throughout the solar system, meaning that humans would be exposed to elevated radiation from the moment they leave Earth's cradling magnetic field. Understanding how much radiation would bombard the spacecraft is the first step to learning how we can shield humans against it. When Curiosity begins work on the Red Planet, RAD's telescope detectors will run for 15 minutes every hour, measuring a broad range of high-energy radiation in the atmosphere and on the surface. It's not fully known just how radiation behaves close to the surface. Although orbiting spacecraft such as the Mars Reconnaissance Orbiter can measure it from above, it's harder for those spacecraft on high to see radiation close to the ground. Of most concern to scientists are rays that can splinter off from radiation hitting the Martian atmosphere. “The high-energy particles can generate secondary, lower-energy particles when they interact with molecules of gas in the atmosphere,” Vasavada said. Most particles in cosmic rays are protons, which can generate secondary gamma rays or neutrons, he added. This process also happens on Earth, but higher in the atmosphere and far away from the surface. According to Vasavada, these energetic particles can ionize molecules inside humans, breaking the molecules apart and damaging cells. Essential complex organic molecules such as DNA could be affected. To capture the speed and direction of the wind, and the air's temperature and humidity, REMS will use electronic sensors on two booms stretching out horizontally from a camera mast mounted on the rover. Ultraviolet radiation will be measured using a sensor stuck on the rover's deck. Some of the wavelengths it will watch for are the same ones sensed by the Mars Reconnaissance Orbiter flying above, providing a more complete record of what's happening on Mars. Inside the rover, an air pressure sensor will taste the air outside through a tube with a small opening to the atmosphere. 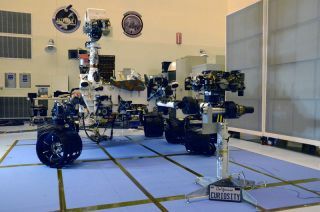 Radiation-sensitive electronics controlling REMS will also stay inside Curiosity to protect them from the elements. Through coordinating MSL's weather and radiation sensing with what is seen from above, NASA expects a better picture of what Mars looks and feels like, making it easier for humans to get there.